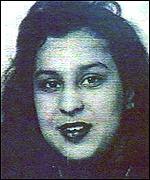 Rukhsana Naz, of Derbyshire, England, was a bright, educated woman. At age 15, she was married to a man she had only met twice. She hoped to one day marry her childhood sweetheart, Imran, by whom she eventually became pregnant. In 1998, when Rukhsana was 28 weeks pregnant withImran’s child, her brother and mother made her clean out a trunk and sign a will. The trunk was to serve as Rukhsana’s coffin, and the will named them the guardians of her children. Then,they invited her to dinner, where her brother, Shazad, strangled her with askipping rope. Rukhsana’s mother held down her legs. Shakeela and Shazad Naz were found guilty ofRukhsana’s murder and were sentenced to life in prison.